UPDATE: Opponents demand public testimony be allowed on new Residential Infill Project economic report. 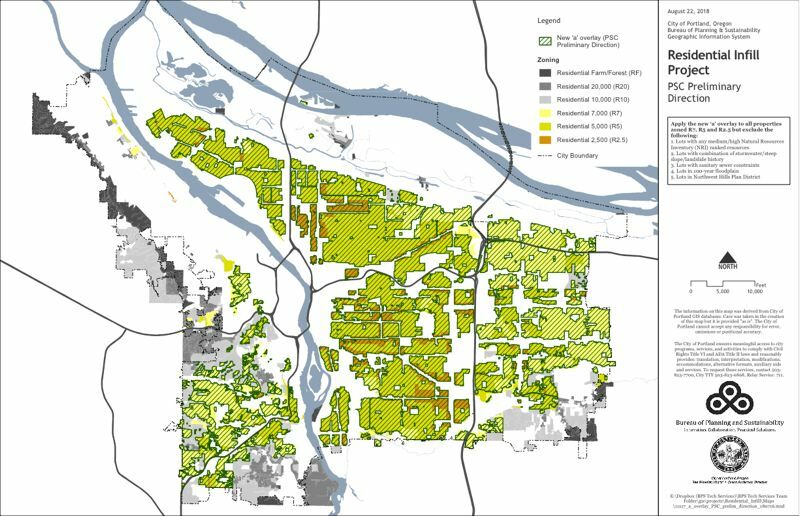 A revised rezoning plan working its way towards the City Council would result in almost twice as many new homes being built in Portland over the next 20 years, according to an economic report released Thursday. The new homes would also be far less expensive to rent because they would be much smaller, mostly multifamily units, says the report prepared by Portland-based Johnson Economics. The Residential Infill Project recommendations are currently being considered by the Planning and Sustainability Commission. It will be briefed on the report on Tuesday, Dec. 11, by the Bureau of Planning and Sustainability, which is planning the project. No public testimony will be allowed, which opponents say is unfair. In recent months, the commission moved to substantially increase the recommended portion of existing single-family neighborhoods to be rezoned for smaller multifamily projects, like duplexes, triplexes and four-plexes. The commission originally considered recommending that 60 percent of single-family neighborhoods be rezoned. It has now raised that 96 percent, or almost all of them. The commission also wants to encourage developers to build multifamily projects by increasing the maximum size of the structures. Single-family homes would be limited to 2,500 square feet but increased to 3,500 for a triplex or four-plex. The changes would result in 38,115 new homes being built over the next two decades. That compares to 13,665 new homes under the city's current zoning, the report says. The original recommendations would have only produced around 200 additional homes. After the Dec. 11 briefing, the commission will then hold a work session on the current version of the recommendations for the project — commonly referred to as RIP — on Feb. 12 of next year. It is then expected to vote to approve and send the recommendations to the council on March 12, setting up a series of council sessions and final vote on them over the summer. The recommendations are controversial. Supporters say the change will encourage the construction of a greater and more affordable range of housing throughout the city. Opponents say the rezoning will change the character of the city's neighborhoods and encourage more existing homes to be demolished and replaced. "It is no surprise that by allowing more units on a single lot, we can lower prices per home. Right now, the only type of housing allowed in 43 percent of the city is the most expensive: a single-family detached home with mandatory space for a car. This latest recommendation will allow for smaller, more flexible, and less-expensive housing options, making it possible for all kinds of Portlanders to live in neighborhoods that are close to schools, jobs, parks, transit, and all the things that we love about our city," said Madeline Kovacs, coordinator of Portland for Everyone, a project of the 1000 Friends of Oregon land use watchdog organization. But the results were criticized by the Multnomah Neighborhood Association, which is challenging the city's push for more "missing middle" housing in court. "The memo shows that the RIP will increase demolitions by 8%, create 24,333 mostly small rental units, promote rentals over owner-occupied units, [and] result in an average monthly rent of $1,823," reads a Sunday email from the MNA, whose members are also demanding public testimony on the report.